I’ve been working on finishing off my NMEA 2000 network for the last year or two, and one of the pieces I wanted to have in it was something that could slurp up all of the data on the network and make it available via TCP to other devices. I had initially decided that I would have to use something like an ActiSense NGT-1 and a Linux system to do this myself, but then I saw posts on Panbo about the Chetco SeaSmart.net gateways. A few weeks ago I finally got around to getting one, and have been pleasantly surprised. There are still some rough edges that are being worked through, but overall the concept is a great one. In the picture above you can see my iPhone connecting to the SeaSmart adapter and streaming NMEA 2000 PGN’s directly into iNavX. I can do this while on board, or based on my router/firewall configuration, while I’m anywhere in the world if I just happen to want to check on what’s going on. You can check out more on how to configure iNavX with SeaSmart here on iNavX’s site. I’ve designed my N2K system to have a portion of the bus that is always on 24×7 for monitoring purposes. 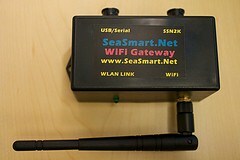 My end goal is to have some of this equipment, perhaps the SeaSmart adapter, monitored and scripted in such a way that I get emails when certain things happen – bilge pump goes on, fire alarm fails, etc. The unit itself is compact and well made, and includes an indicator light to let you know when it’s up and running and on your WiFi network, antenna, N2K connector (somewhat proprietary unfortunately) and a USB/Serial port for diagnostics and local use. Configuration is documented on their website, and they have great support in their forums. Once up and running, I can see various instruments, as you can see from the below, as well as charts. Here’s an example of my iPad showing charts, including the plethora of AIS targets in the local area. I’m using Navionics Gold charts with iNavX – I highly recommend purchasing the charts for iNavX instead of using the standard NOAA raster charts, as they require you change charts for clarity (just like flopping around paper charts) depending on the area you want to see. 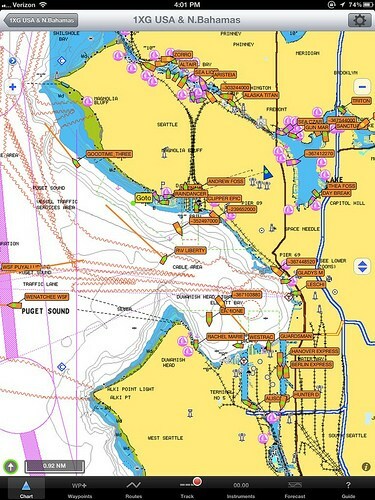 Navionics Gold charts can be acquired through X-Traverse. 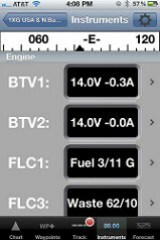 Below is the SeaSmart main web interface showing some info from my Maretron battery sensor. You’ll note there is still some adjustments to do to get everything happy. 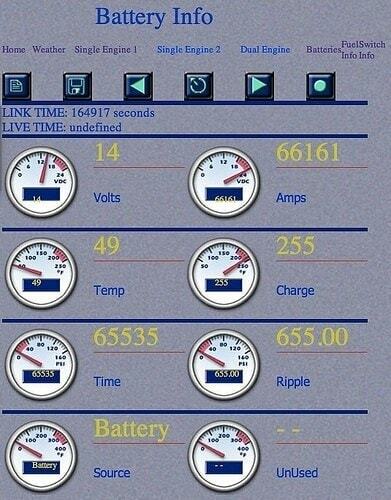 I don’t think I have that many amps heading out of my batteries – if I do I’m probably in trouble!